Cecilia Brunson Projects is proud to announce the opening of an exhibition of a unique and rarely seen early sound mural by Jesús Rafael Soto. The exhibition will present the single large scale mural, Jesús Rafael Soto, Untitled (mural rome), 1968. The mural will occupy the whole of the gallery space. The sound work represents a pivotal moment in the artist’s practice. It depicts the crucial point when he pushed his practice away from traditional confines of material and sought dematerialisation. This work represents a key moment, when the wall based Vibraciones works were freed from the two-dimension and then pushed into the free-standing Penetrables. It also marks the point where he liberated the concept of participation with the work. Contemporary art is the art of participation. All men contribute to the artistic creation at the same time that the artist produces it. Uniquely amongst his free-standing murals, music is an integral element in this piece. 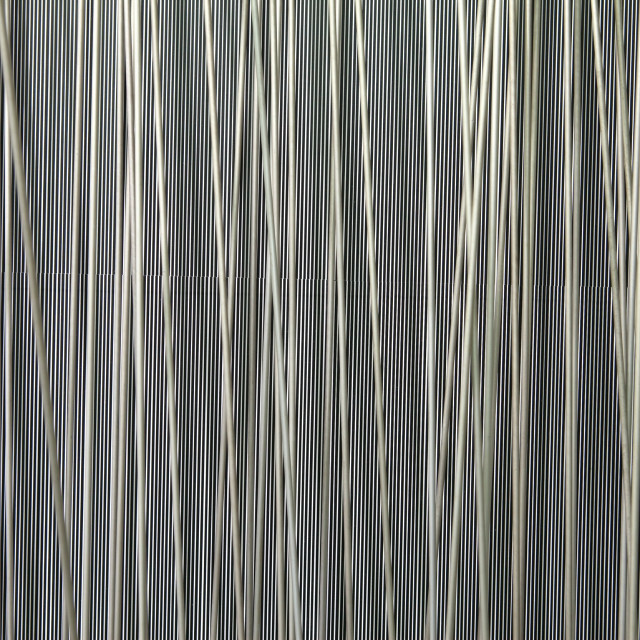 When this mural is touched, the vibrations of the metal rods become sound and the piece becomes a sonorous work. The work will be accompanied by a film made to mark the mural’s first showing, depicting the exceptional sight of Soto interacting with and ‘playing’ his works, including this mural. The film also shows footage of Soto playing the guitar in front of the mural, as well as of him interacting with the elements of the piece. Free-standing murals were a key element of Soto’s practice. Over the course of his career, Soto was to make a number of murals. Two were commissioned in 1969 by UNESCO for their buildings in Paris. Several more commissions followed over the next decades, including two in Caracas, Venezuela: one in the Chacaíto metro station and the other on the ceiling of the Teatro Teresa Carreño. Another work, Mur Panoramique Vibrant, was exhibited in the Venezuelan Pavilion in the 1966 Venice Biennale. What sets this mural apart from all of the others and makes it so special is the sound element. The film ‘SOTO’, made in 1968, will be shown at the gallery during the exhibition. There will be a conversation between Dr Isobel Whitelegg and Cecilia Brunson during the private view discussing Soto’s first London exhibition at the Signals gallery in 1966 in the context of this exhibition.